The holidays are right around the corner. To ensure you receive your Stampin' Up! 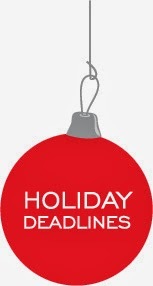 items before the holidays, all orders must be placed by December 10. You can still order after Dec. 10; but, we cannot guarantee delivery before Christmas. To place an order, simply send me an email, call me at 289-280-0304 or shop my online store!